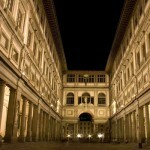 The Synagogue of Florence is of Orthodox, Sephardi and Florentine Minhag tradition. It is one of the most important and most beautiful Synagogues of the XIX century, designed in 1872 and finished in 1882. When the ghettos were taken down in 1848, the Jewish population could finally live were they wanted to. 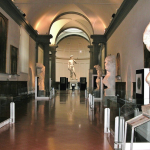 The city of Florence in that same period was undergoing a profound change because it had been chosen to be the capital city (1864-1870) and the Ghetto was to be replaced with what is today Piazza della Repubblica. The square and all the nearby buildings are, in fact, all typical 19th century style. In the same period the Medieval walls that surrounded the city were torn down and the Viali (ring road) was created. Thus it became necessary to create a Synagogue were the Jewish population could pray and a building for what would become known as “the Synagogue of the Emancipation”, designed as an independent monument and no longer simply a space in private homes like when they were confined to the ghetto: the “Scole”, as they were called then, were found inside buildings and therefore small and not visible. At first the project was assigned entirely to the Marco Treves, a Jewish architect from Piedmont who had already worked extensively in the field, but endless discussions with the Jewish Community led to the appointment of two very popular architects who would help Treves in the construction: Vincenzo Micheli and Mariano Falcini. The project was, however, carried out by Treves in every detail. Moorish style was chosen: Treves decided to construct a cupola covered in copper to accentuate the assimilation with the city of Florence and the cupola by Brunelleschi, and also to assure that the cupola could be seen from the entire city. Even today, in fact, the cupola is an important presence in the skyline of the city. Outside, a pink marble from Assisi was chosen to resembled the colour of the stones with which Jerusalem was built; the fleur-de-lis that line the borders are the symbol of the city of Florence; and the beautiful rosette found on the lateral façade is also made up of fleur-de-lis with a geometric design using six points that make up the star of David in an intricate layout much like, symbolically, the Jewish population that comes together in the city of Florence. The garden was designed in oriental style with palm trees, agaves and other plants which, however, did not survive the rigid climate of Florentine winters, and which, in time, were replaced with Magnolias. The interior reflects the Moorish architectural style, from the window panes to the walnut doors carved with arabesques, and the pavement, with perpetual chains made from geometrical designs that are never broken and with the star of David as the symbols; the matroneo-mehizà is open and the designed grates also reflect the oriental design. The interior is completely covered in arabesques, once shiny gold, today it is hardly visible: lack of funds made it impossible to use gold leaf and purpurin, which fades easily, was used instead. An example, however, can be seen in the Museum on the ground floor. 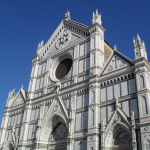 The construction was made possible by the funds put forth by David Levi whose only desire was that his inheritance be spent to give Florence a Jewish place of worship that would equal the beauty of the city. The inside of the Synagogue of Florence is very much like a basilica with three central naves and an apse. The presence of a pulpit and an organ are worthy of note and surprising to many Jewish visitors. 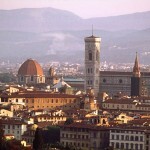 The great Synagogue is one of the most beautiful long-lasting structures in the Florentine panorama. It withstood the Nazi bombings, the terrible flood of 1966 when the Arno River covered the city in three metres of water, and the test of time. Preserving this monument not only means preserving one of the most beautiful 19th century structures but also preserving a page of the history of Jewish Florence.